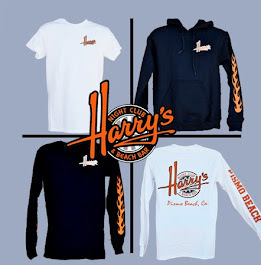 Harry's Night Club & Beach Bar: Join us for our annual Halloween Party at Harry's this Friday, October 31st! 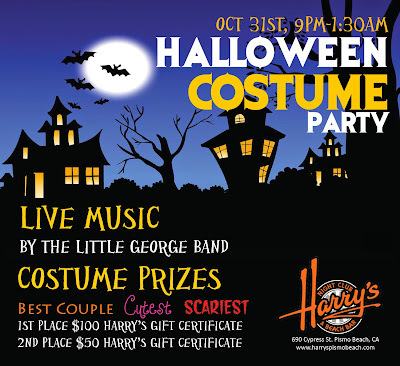 Join us for our annual Halloween Party at Harry's this Friday, October 31st! 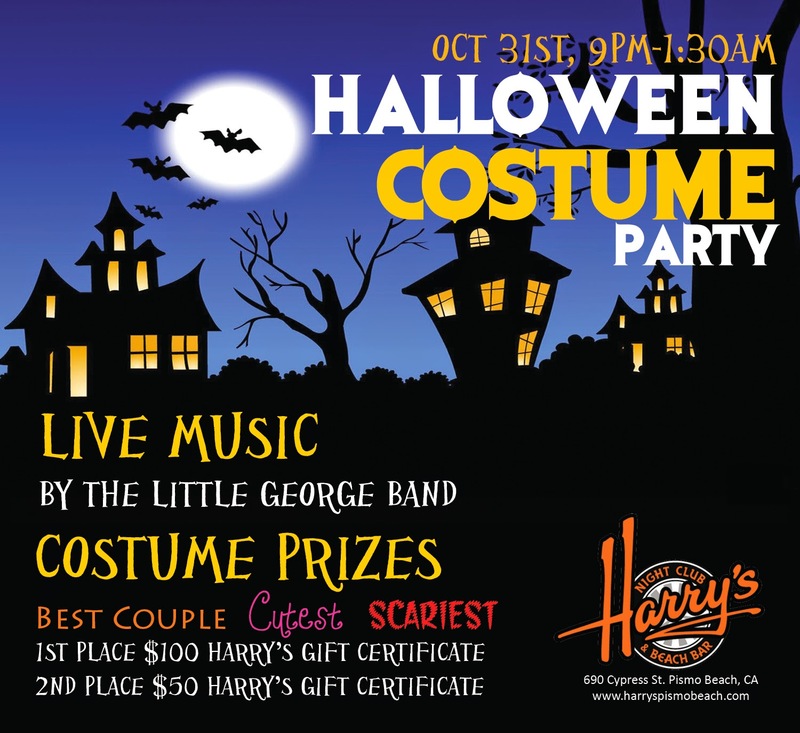 Join us for Harry's annual Costume Party on October 31st 9pm-1:30am! We will have live music by The Little George Band and a costume party and contest! Winners announced at 12:30am! It's only a few days away! What are you going to be for Halloween? Not sure what you are going to be for Halloween yet? Here's are a few last minute ideas! If you need a clever Halloween costume in a pinch, these ideas are just the ticket. We all have been there: scrambling to find that last-minute costume, and more than likely coming up with something that is, well, not great. 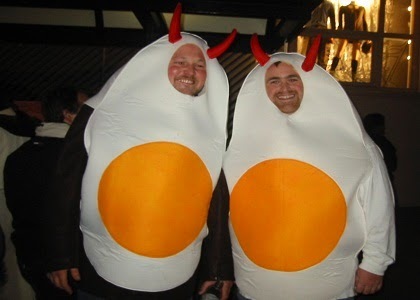 Here are funny costumes that will have your friends thinking you are so clever that you have been conjuring up the idea for months. All the items on this list are items that you may already have around the house, and if you don’t, they are very inexpensive to buy. You don’t have to wear an elaborate costume to get a chuckle, and what is most fun about these costumes is letting your friends see if they can figure out what you are. 1. Wear a bridal gown and sneakers. - Runaway bride. 2. Paint a shoebox black and affix it on your back. - A refrigerator magnet. 3. Wear all white, and attach old milk cartons, wrappers, etc. to you. - White trash. 4. Wear all black and stick a postage stamp (enlarged is best) on your chest. - Blackmail. 5. Wrap yourself in wrapping paper with a tag: "From: God, To: Women". - God's gift to women. 6. Attach sugar-cubes (or candy) all over yourself. - Sugar-Daddy or Sugar-Momma. 7. Tie a CD around your neck while carrying a lighter. - A CD burner. 8. If you don’t plan on attending, say you're going as a cable-guy - since they never show up. 9. Get a small dumbbell and stare at it intensely. - Watching your weight. 10. Tape a photo of an enlarged quarter to your back. - A quarterback. 11. Place a pot on your head. - A pot head. 13. If you have an old black leather jacket, jeans, and some hair gel - 50s guy. 14. Place a piece of Styrofoam under your t-shirt. Stick a fork in it – You’re 'done'. 16. Dress in all pink and carry a feather - Tickled pink. 17. Carry a quarter and a hammer -A Quarter-pounder. 18. Paint one of your fingers gold. - Gold finger. 19. Dress normally, but pin some dryer sheets, socks and hand towels to your shirt - Static cling. 20. Carry around some paper, and if someone asks what you are tear one up. - A paper shredder. 21. Wear a catcher's glove and stick pieces of rye bread to you. - Catcher in the rye. 22. Use string or tape to attach stuffed animals of cats and dogs to an umbrella. – It’s raining cats and dogs. 23. Wear normal clothes, but tape a dollar on each ear. - A Buccaneer. (Buck-an-ear). 24. Dress in a nice suit, but attach legal documents to it. - A law suit. 25. Hold a toy airplane. When someone asks what you are - An aircraft carrier. 26. Put a sign that says "Go Ceilings!!!" on your shirt, and cheer - A Ceiling Fan! 27. Dress all in black, wear a shot glass around your neck - A shot in the dark! 28. Write the letter C seven times on your face and arms. - The Seven Seas. 29. For a couple: one dresses as a brick; one as a mason. - A brick-layer. 30. Wear red, white, and blue - Instant American Flag. Big Weekend in Pismo Beach!